Ok, who is it that I've named both of my boys after? Who's best known series do I host a challenge for on what is now a yearly basis? Who is the theologian that I most adore? I love the Chronicles of Narnia. Very much so. I think they are ingenious and I love slipping away to Narnia whenever the opportunity presents itself. I frequently think of Aslan and my heart swells and sometimes I even cry. Oh yes, I do! Thanks to Uncle Christopher, we have an Aslan figurine that we can play with. Whenever I hand over Aslan to Bookworm1 I say with a solemn voice, "Now remember....he is not a tame lion." Bookworm1 always gets this look of awe on his face, sometimes trepidation and he stares at the little Aslan in my hand very intently. Then I say, "But! He is GOOD!" and with smiles on our faces we laugh. It's a little thing between us, on its face. However, I'm intentionally communicating with my son about who GOD is when I hand over this little Aslan. God is not tame. He does not operate the way we tell Him to. He isn't to be bought or bribed and He's not obedient to our whims. He is a GOOD God, ever faithful to the end. I love (very much love) my interchange with Bookworm1 on this. You cannot even fathom the way my heart leapt when Bookworm1 handed Aslan to me once and said, "He is a not a tame lion, Mommy. But! He is good!" Yes! Yes! Yes! Remember that, my son. Remember that! Because I love The Chronicles of Narnia for the truth which it communicates, I have a The Chronicles of Narnia Complete Radio Theatre Set to giveaway to one of you. That's right folks - all 19 CDs of the Focus on the Family radio series can be yours. I recently bought a copy for us, not knowing how Bookworm1 would take to it. He sat, captivated, in front of the CD player. We listened to the entire store of The Lion, the Witch and the Wardrobe together. (I'm not really an audio listener/learner, but I listened along with my son to explain it to him.) Fabulously well done story and I imagine the rest are like them (although we haven't listened to them yet). We'll make good use of this CD series and I invite one of you to also make good use out of your own set! Would you like to win this? Then leave a comment below. U.S. Residents only, please (sorry, folks). I wish I had multiple copies to pass along. Really, I do. I plugged in Random.org and it selected SKY as the winner. So, Sky, I'll just be popping you an e-mail really soon here. =) Congratulations! I know your family will love it. We would love to own these - what a great giveaway! I've read through Prince Caspian aloud to the kids, but we havne't gotten to the rest of the series yet. I am very interested in winning this! Thanks for this giveaway. CS Lewis is one of my favorite authors! I have read the Narnia series and am actually using it in a literature class. FOTF audio drama series is phenomenal!I have listened to the entire series and have come to the conclusion that it's definitely worth taking the time to listen to it. Oh my gosh...this is fabulous. We love the FOF theater productions and have listened to several of the Narnia books this way. They are gems. I would love to share this audio production of Narnia with my sister's children. My girls love listening to theater CDs and books on cds. They'd love it if I won this. Thanks for the give away. I love these books and look forward to sharing them with my children - this would be a great way to introduce it! Popped over to wish you a very happy birthday, my birthday twin (and only a few years apart, ahem...)! Hope your day is blessed with lots of laughter and fun! I LOVE listening to this series on the radio!! The CDs are definitely on my list of things to buy. I'm thinking this Christmas might be the year. My email can be found via the profile link. My daughter and I would love to add these to our Narnia collection. Your challenge made me WANT to complete all 7 books this summer. I am so grateful. Narnia is a very special place! Wowsers and woot! We WOULD like to win this! Since we listened to MANY audio tapes when the kids were little, and loved them, i know we would love these, too. Audio CDs are a great addition to the wonderful custom of reading aloud to the kiddos! This is such a generous giveaway!!! It's great to see you practicing "more blessed to give than recieve" on your birthday! We have listened to an unabridged reading of most of the Narnia books, which was available at our library. I like the "purity" of an unabridged version, but I'm sure my kids would really enjoy the FOF dramatization. Please enter me in this giveaway, and thanks for reminding me of a good gift idea if I don't win. Oh, I would love to win this! My favorite combo....C.S.Lewis and audio drama! Oh me please, me please! Remember how I said we just haven't caught the fire??? See, maybe this would work. I'm really not sure why Amanda doesn't just love it, but she doesn't. However, I'm thinking that a few years on down the road, it could be just Kyle's thing. Oh, what a delicious treat! FOTF CDs on the Chronicles of Narnia. LOVE to be read to! Great to share with the kids. Oh, count me in on the contest. Thanks! Win a Narnia piece? Of course I want to win! Hope you had fun you know where! SOOO jealous! Carrie you're so pasionate!!!! I love that in persons! Good for you, don't change!!! Do you usually have daydreams about you, and.. for example in Narnia's world? Oh! about L.M. Montgomery Challenge, well I think I can´t participate, I only read three of her novels, sorry. Here, in Argentina, there isn't editions of her books, so I can't get them; I only have old editions, or well, I have a friend that travels to Spain very often, so I will ask him for the rest of the books hihihi!!! I will be reading Chronicles this year with my little boy and growing girl and it would be a blessing to have the audio series! Thank you for giving one away! My boys would love this for our road trips to grandma. Please enter me. We've been listening to audiobooks lately as a means to cut down on tv watching, and I have to admit that I've somehow never read any of the books in this series. Thanks for the great giveaway! Please enter me. My kids just love Narnia. I'd love to own these! Please enter me. I had such fun reading this during the Narnia challenge - listening to them again woud be wonderful! What a gerat giveaway! that's amazing your son will sit and listen. I'd love to be included. C.S. Lewis is one of my favorite authors too--I named my last car "Jack" in his honor (not quite so spectacular as naming a son, I know). 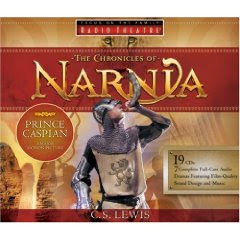 I would love to win a copy of the Chronicles of Narnia audio drama. So glad to hear your kids are not named after the "C" or the "S"! A terrific giveaway that I would love to win for my daughter! Now you have me curious as to your children's names!! As a young Christian I first read the Narnia series...and loved it as an adult! I also really enjoy audio books. Our collection will have these some day, but I'd love to win it! I have had an audio version of the Narnia series on my wishlist for ages, so please add me to the list! Our family loves this so it will be just perfect!!! Thanks for this chance to win!!! This would be awesome! We love audio books! Thanks for the opp! I bet this would be awesome to listen to in the car on our 14 hour drive to AZ for Christmas!